SurveyRewardz is a website that offers online paid surveys. There are many sites like this, but not all are legit and worth joining. So is SurveyRewardz legit and one of the sites worth joining or a scam site you should stay away from? I have tested the site thoroughly myself, and in this SurveyRewardz review, you will find all the details about what the site offers, so you will know what you get into before you join. What is SurveyRewardz and what does it offer? SurveyRewardz is purely a survey site, which means the only way you can earn here is by taking paid surveys. It is however in some ways a little different from other sites that offer this. Sites that only offer paid surveys as a way to earn are usually easy to use, as they often have a simple design and do not have many distractions. That is also the case for SurveyRewardz – it actually has one of the most simple designs I have seen, but it is still modern, and it is extremely easy to navigate the site. Once you have become a member, it is very easy to find out how to use the site. After you login, you can right away see, if there is an available survey for you. It is easy to see, if there are available surveys on SurveyRewardz. As you can see on the image above, you can see the reward and the estimated time it will take to complete the surveys you are offered. 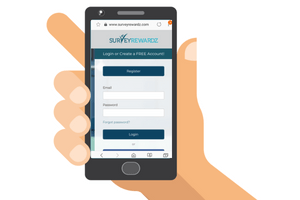 What makes SurveyRewardz a little different from some other sites is that you do not get a long list of all the surveys available to you. When you login, you can only see one survey offer at the time. This does however not mean that there is only one survey available to you. Once you click to take it, a new screen will open, where you can take it. Most of the time you will have to answer a few prequalifying question about your gender, age, and work, before you will find out, if you qualify for the specific survey. If you qualify or not depends on your personal demographic profile. If it is a survey only for young women, you will of course not qualify, if you are a man. So you will at times (and sometimes often depending on the country you live in) not qualify, but this is the case on any survey site. The great thing about SurveyRewardz is that if you do not qualify, you will be offered a new survey. If you do not qualify for a survey, you are usually offered a new one. In this way SurveyRewardz works as a survey scanner, and keeps scanning for new available surveys for you. This means it has a good amount of available surveys you can take. Sometimes it takes a little patience to find the ones you qualify for, and sometimes you are able to take several surveys in a row. So if you do not qualify right away, do not give up. What kinds of rewards you can get are important to know before joining any survey site, so you are sure you can get paid in a way that suits you. SurveyRewardz luckily has many rewards to choose from, so no matter your preferences, you should be able to find a reward method that fits you. I personally prefer sites that pays through PayPal, as this is an easy way to get your rewards in cash, and SurveyRewardz for example offers this option, which is great. But it also offers many other great rewards. You can for example get Amazon.com gift cards, Virtual Visa, gift cards to many stores, or get paid by check. A really great thing about SurveyRewardz is that it has a low payout threshold, so you will very quickly be able to get your rewards out. If you want to get paid through PayPal, you can get paid already when you have earned $1. Be aware that if you withdraw your money through PayPal for an amount below $10, there will be a fee of $0.10. The payout threshold for most other rewards is $5, which is still very low and can be reached quickly. So overall the payout methods and the process of it is very good on SurveyRewardz. How much money can you make on SurveyRewardz? It is always difficult to say exactly how much money you can make on a survey site, as it depends on several things. On SurveyRewardz there are mostly prequalifying questions, and it depends on your age, location, work, etc, how many you surveys you will end up qualifying for. In addition to this it of course depends on how active you are. If you login every day and take a few surveys, you can make some really nice extra money, but if you only login a couple of times a month, you will of course not make much. So it depends a lot on your effort as well. What is however great on SurveyRewardz is that you can always clearly see how much you will get paid, and approximately how long it will take, before you take a survey. Some surveys pay really well in relation to the time spend, while others pay a lot less, so it also depends on which surveys you choose to take. It is always up to you whether you want to take a survey or not. No matter how many surveys you will take, you should however be aware that taking online surveys will not be able to replace a full-time income. It is however one of the easiest ways to make money online, as everyone can do it and you will start making money from day one, and it can make you some really nice extra money. So if you do it with the right expectations, it is definitely a legit a great way to make some extra cash. Being able to use a survey site on mobile devices is great, as you can then take surveys and make money whenever you just have a few extra minutes during the day. It is possible to use SurveyRewardz on your mobile. It does not have an app, but it does not matter too much, as the website is fully optimized to use on mobile devices, so it gives a very good user-experience, when you use it on mobile. Some of the surveys you take might not be fully optimized, but they are still possible to do, so if you like taking surveys on your mobile, this is possible on SurveyRewardz. You can join SurveyRewardz no matter where you live. The amount of opportunities will vary from country to country. It has the most opportunities for United States, United Kingdom, Australia, and Canada, but you will also be able to find a good amount of surveys in many other countries. If you do not live in one of the countries mentioned above, it might take a little more patience to find the surveys you qualify for, and in those cases it can be an idea to check out the best sites for your country instead. You have to be 18 years old to join SurveyRewardz, but it is possible to join already when you are 13 years old, if you get your parents’ consent for it. If you should need support with your SurveyRewardz account, it is easy to get. Once you are logged in, you can easily see where to find support. To get help you need to submit a support ticket. Most tickets are taken care of within two business days. It is however nice that when you are about to submit a support ticket, you can see what the current average waiting time is. You can always see the current average support response time. This gives you a good indication of when, you can expect to get an answer. If you need to contact support before logging in, you can do it through a contact form on the website, or you can send a message on the SurveyRewardz Facebook page. I would however suggest using the contact form on the website, as the Facebook page is not used very actively. SurveyRewardz is definitely a legit survey site. This does however not mean it necessarily will be the right option for you. So let’s sum up the pros and cons so you can get a better overview, before you decide to join or not. 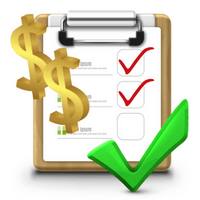 Overall SurveyRewardz has fairly good opportunities to make some extra cash by taking online surveys. Especially if you live in the US, UK, Canada, or Australia. If not, there will likely be sites that are better to join in your country. SurveyRewardz has a lot of pros. The only con is that it sometimes takes a bit of patience to find the surveys you qualify for, but if you have this patience, it gives a good amount of surveys, great reward options, and you can get your money out very fast. If SurveyRewardz sounds like the right option for you, just click the button below to join. It is very easy to join SurveyRewardz and it is 100% free to join. You just fill in your email, answer a few questions, and then confirm your email. In total, it only takes a couple of minutes. Once you have signed up, you might receive an email, where you have to do a couple of small test questions. This is to check you are actually a person and not a robot. The questions are very simple (like what is 4 minus 3 kinds of questions), and take less a minute to do. And then you can start taking paid surveys. So if you want to join, just click the button below, choose your country, and you will then be taken to the sign-up page. If you have any comments, questions, or have any experiences with SurveyRewardz yourself, I would love to hear from you in a comment below. SurveyRewardz is a legit survey site with a good amount of survey opportunities in some countries. It offers great rewards, and you can get paid out quickly. Sometimes it takes a little patience to find the surveys you qualify for, but with a bit of patience, it gives great opportunities. Survey Rewardz can be alright if you have the patience to qualify for their surveys and they do pay. Lately, though, they have been having really cheap incentives for a lot of their survey like 20 cents and even 16 or 17 cents. I don’t know what I’m going to do with them yet, probably quit. Thanks for sharing you experience Pam. In my experience it can also sometimes take patience to find the surveys you qualify for on SurveyRewardz, but luckily there are mostly several surveys available. I have not experienced that it recently has given lower rewards. Maybe it is just a country specific thing? Let’s hope it is only temporary for you. But there are luckily many other great survey sites instead you can use, if you decide to quite SurveyRewardz at some point. I will be happy yo give you a few ideas of the best sites to join, if you tell me which country you live in. There are many great sites in the US. I have made a list of the best sites in the US – you can check out the list here. You will find a lot of sites with good opportunities there. And let me know if you you have any questions about any of the sites, and also feel free to share your experiences about the sites you try or have tried. It would be great to hear about.